Until the early 19th century, fewer than a billion people lived on Earth. As of 2018, there are 7.6 billion, global population has doubled in the last half-century and we add a million more as net growth every few days – the equivalent of the population of Germany each year. 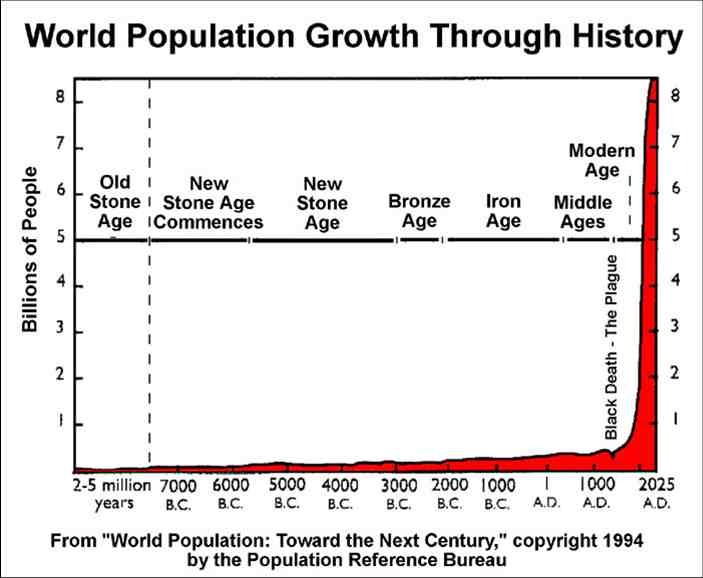 Contrary to popular belief, a flattening of population growth by the end of the century or sooner is far from inevitable. The UN’s 95% certainty interval for 2100 ranges from 10 to nearly 13 billion. The top projection shows almost no decline in rate of growth by the end of the century. Under other scenarios, population growth could be even higher and the UN admits to “significant uncertainty” regarding fertility rates in high fertility countries. The millions added to global population annually all require food, clean water, land, shelter, infrastructure and material goods. Supplying their food needs alone contributes to soil erosion, water depletion, biodiversity loss and climate change. They generate CO2, deplete finite resources and put pressure on renewable resources. Currently, vast disparities in consumption and environmental impact exist, but even with billions living in poverty, the Global Footprint Network calculates that we are currently using the renewable resources of 1.7 Earths. The global average Total Fertility Rate (TFR) is 2.5 children per woman. The ‘replacement rate’, at which population stabilises over time, is 2.1. In many of the richest parts of the world, TFR is below replacement rate, but the environmental impact of each child in those areas is vastly higher than in developing nations. The engine of population growth over the next century will be sub-Saharan Africa, where the average fertility rate is 4.75 children per woman and the median age for childbirth just 18, meaning hundreds of millions of people in or entering their childbearing years. The region’s explosive population growth stretches resources, acts as a brake on economic development, can lead to intensive local environmental damage and contributes to migratory pressures. While the global environmental impact of Least Developed Countries (LDCs) is currently negligible, high population growth will significantly compound the harmful effects of any increasing affluence in decades to come. Adding millions more carbon emitters to the planet every week places a greater burden on all other solutions to climate change we might employ. Stabilising population enhances their benefits. The Project Drawdown analysis of available and workable policy measures to minimise global greenhouse gas emissions ranks family planning and educating girls among the top 10. It found that together, they would reduce projected CO2 emissions by 120 gigatons by 2050 — more than onshore and offshore wind power combined. Their enormous positive effect is a result of their proven effectiveness in reducing family size and thus population growth. Global population growth can be curtailed, using ethical, humane approaches that empower people, bringing multiple other benefits. Girls’ education, women’s empowerment overall and poverty reduction are proven to cut reproductive rates. Most of all, effective, well-resourced, voluntary family planning programmes work, addressing contraception concerns, challenging cultural pressures and encouraging smaller family size are essential tools. Where people have the opportunity to choose smaller family sizes, reduction to or below replacement rate can help achieve a sustainable population.